Friday Favorites – Start a Friendsgiving Tradition! It’s the start of the thankful season. Everyone is posting their daily gratitude on social media to express what they are thankful for. Here is what I am thankful for- food. I am really thankful my kids have enough to eat (and even throw away). I’m also thankful for organizations like Share Our Strength which helps feed hungry families every where. No Kid Hungry.org helps connect thousands of kids around the country to food resources. They educate struggling families how to to prepare low cost, healthy meals. Anytime this November you can host a pot luck, or gathering in your own home with friends and ask everyone to give a financial donation (or, they can donate online at any time). What a great way to connect with friends and family before the busy holiday season starts! Plus, you can help bring Thanksgiving to other families who cannot afford a meal on their own. Spending time with your friends AND giving to a good cause makes “Friendsgiving” a win-win! To host your own FriendsGiving event visit the No Kids Hungry website and start a fund raising page. Register your event, send out invites and check out the resource center for tips on how to host a successful event! Super easy!! There are also incentives for raising the most funds! Check out the No Kid Hungry blog for details. Why not make this an annual event and start a new tradition with your friends and family? Or, get your school involved and encourage your kids to help give! « There’s No Crying In Childhood! 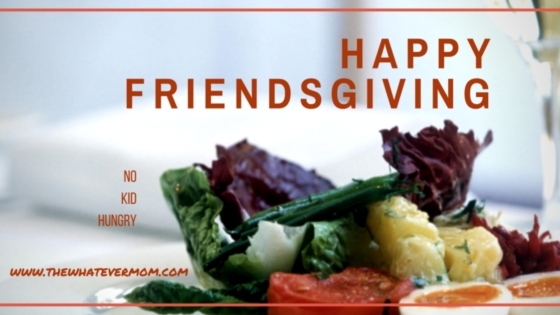 26 Comments on Friday Favorites – Start a Friendsgiving Tradition! This is such a sweet idea! It’s heartbreaking just how many kids here, in America, go to bed hungry at night. Thank you for sharing this! I love this! Any organization that helps starving children is amazing in my book! Thank you for sharing! I love doing a friendsgiving! Collecting donations is a great idea! What a great way to help others. It really is a horrible thing that so many children go hungry in our country. No child should be hungry! What a great way to help feed the hungry. I’d like to join in this campaign. I really admire the Share Our Strength cause. This is a great way to help out around this time of year. I like the concept of FriendsGiving!! I will share this idea!! You can just as easily use the concept on a local level in your town. I love friendsgiving! It is better than thanksgiving! You are right what can be better than dedicating November to sharing food. Plus, it’s good to get kids involved! I hosted a Great American Bake Sale table for the No Kid Hungry campaign a couple years ago. It’s a great cause, and it really makes sense to combine it with Thanksgiving traditions! Omg I love the idea of a friendsgiving! My family lives so far away that this would be great for me! I have never done a Friendsgiving yet but this is such a great reason to DO one. What a great idea! We need to start doing something like this! Definitely a win-win! Thanks for letting me know about this! Thanks for reading and taking time to reply! What a wonderful way to help people! I need to research this more! That’s such a great idea to help other families in need. If I was able to host something like this in my own home I totally would.